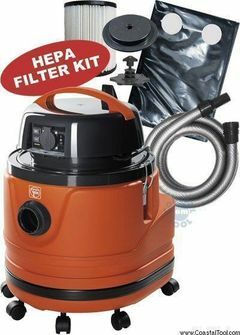 The Fein Turbo II 9 gallon dust extractor vacuum has been redesigned with an optimized shape and 6 wheels instead of 4 for added stability. Also at an average of 60 decibels, the 9-20-25 is far quieter than most other popular vacuums. The variable suction control on the Turbo II saves energy and reduces noise level to an absolute minimum. I needed a new vac for my sander. For me the choice was between the Festool MIDI and the Fein HEPA. I chose the Fein because of the specs and the price. More CFMs, higher water lift, cheaper. What I liked about the Festool was the on board tool storage and the fact it has a flat top which means it is stackable. But mostly it will be used in my shop so I wasn't to worried about those things. What I don't like is the 1 1/2" hose, it has a 2 1/4" port, should come with a 2 1/4" hose. The tool accessories are pricey. But a lot of Rigid vacuum accessories will fit it so that is where I will head on sccessories. It has an auto outlet. Plug the vacuum into an outlet and your tool in the vacuum and when you switch on your tool the vacuum turns on automatically. It has 5 levels of suction, just press the +/- and it will slow or speed up. Has nice wheels on it that let the vacuum roll with ease. The 16' hose is heavy duty and nice and flexible. It has a 16' electric cord. So that gives you 32' of movement. I really like mine as well. Everyone comments on how quiet it is. I was taking a regular shop vac to the jobsites, but since it is only me I take it with me everywhere now. My few complaints are that is isn't very ergonomic to carry around, or put in the rig. Also the hose storage is non existent it keeps unraveling. rubber neck on teh bag lets dust past and it dirties up the filter which is expensive. Other than that it is a great unit. If you use it in a shop, it is perfect. My complaints are more annoyances than actual complaints, though if I had to do it again, I would go Festool. I think the Festool was actually a few dollars cheaper, but it was in that period when they were sort of HEPA compliant and I needed it that day.